Kaya is traveling across North America in search for rock climbing adventures. 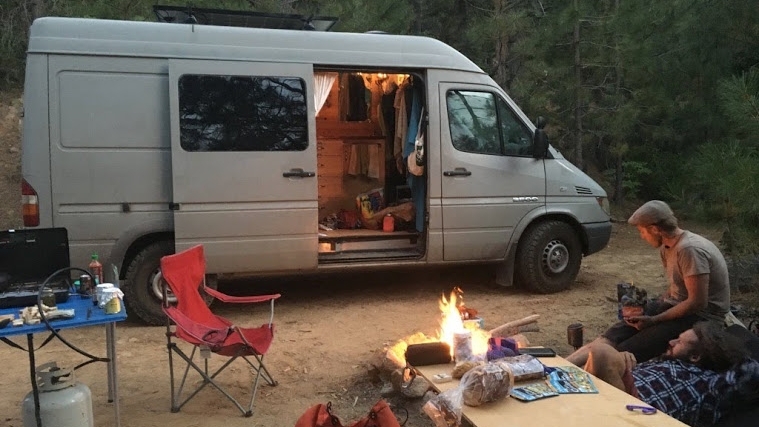 She has outfitted a 2006 Dodge Sprinter Van with a 144 inch wheel base. 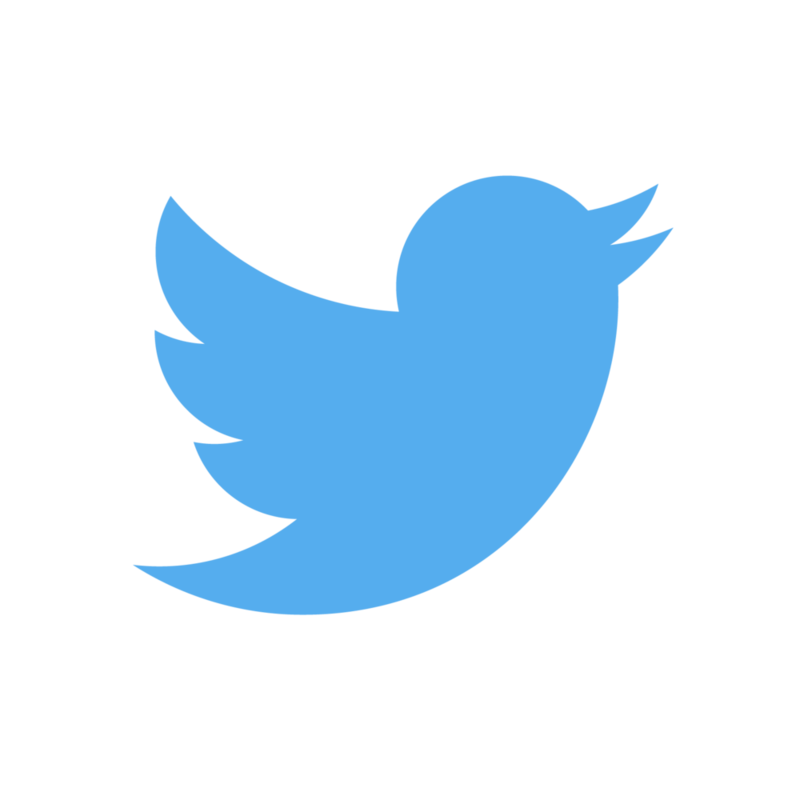 The 5 1/2 ft width provides a living space amounting to about 55 square feet. The exterior is painted grey which is perfect for "stealth mode" in cities and public areas. The vehicle has one sliding side door providing ventilation and expanding the space to the outside! 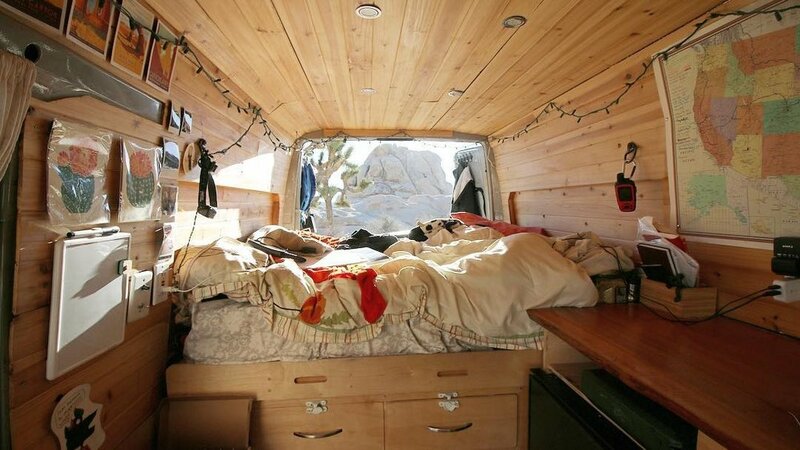 The inside of the van has a wood cabin feel to it with stained tongue and groove paneling and a wooden countertop and floor. 6 over head spot light LED's and white christmas lights allow for both control of brightness in the van and usage of battery power. The first thing you see when you step in is the map of the USA tracking her travels and where she spends her time rock climbing. 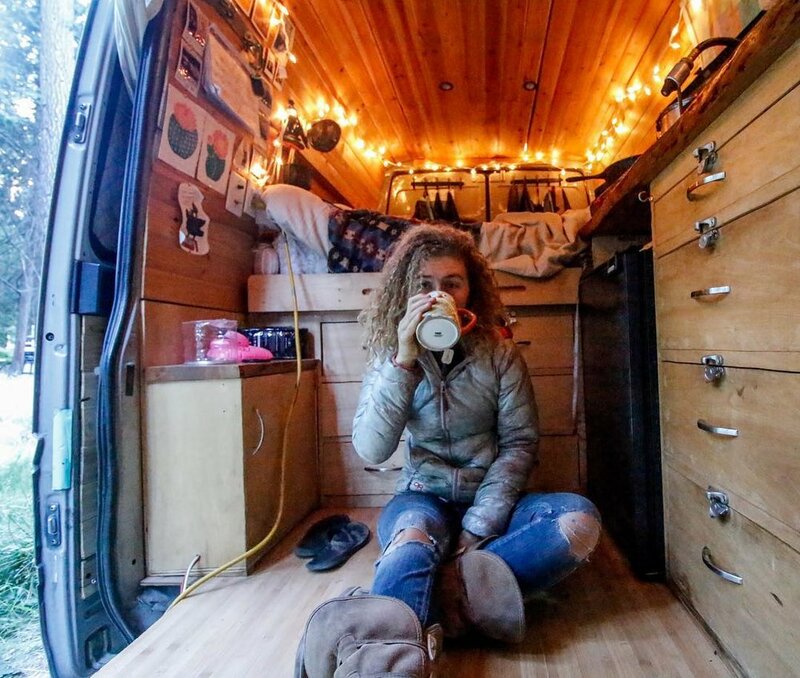 While this van is super cozy, Kaya spends most of her time outside climbing with friends or practicing yoga in her off days. Kaya's layout for her kitchen was to be as efficient with space as possible. She has modified a cabinet that serves as a kitchen counter, sink and dining table. Kaya can easily set up her Coleman stove on top of the counter when she wants to cook. The stove traditionally uses small 1 pound propane tanks but with an adapter Kaya can hook it up to a 5 gallon propane tank which stores under her bed. She has an electric DC fridge that is powered by her solar panels and opens from the front like a normal house fridge. Something unique to Kaya's van is her bed which can fold up and double as a couch if the need arises. She often has guests over, and this is a great option to have to maximize her space. 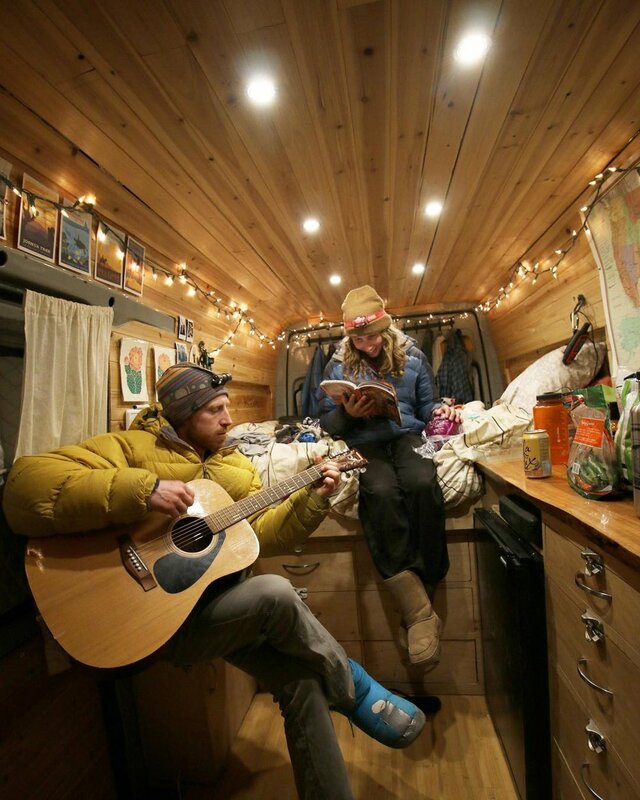 Kaya built the mattress herself by cutting up an old memory foam mattress so it could fit into her van properly. The bedroom is dimly lit with christmas lights strung along the sides to provide a conforting ambiance. The bed also sits on 6 drawers where she puts her pants, shoes, clothes and other miscellaneous items. 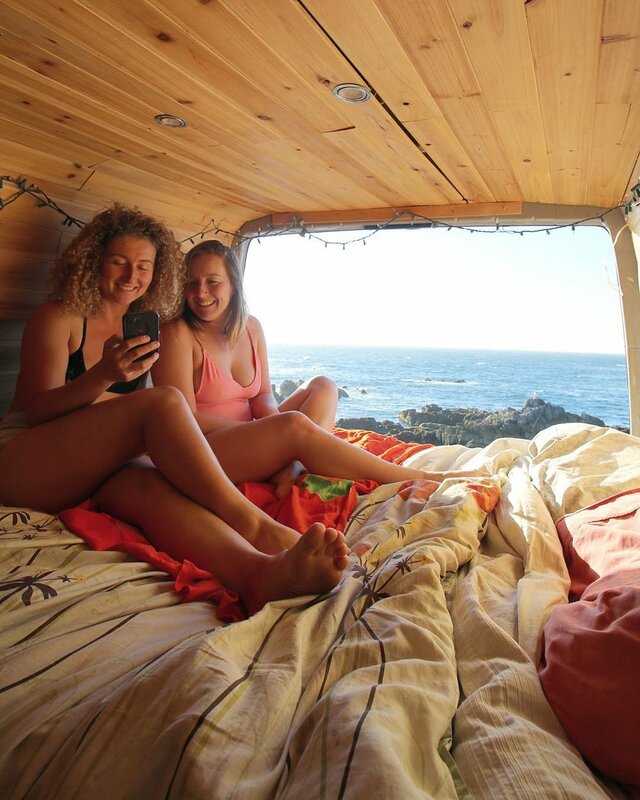 Kaya is always in search for warm weather not only becaue it makes for a more enjoyable van life but also to allow her to continue rock climbing in all months of the year. This allows Kaya to frequently live outide or at the least keep fresh air flowing through by opening her large sliding door and back door. 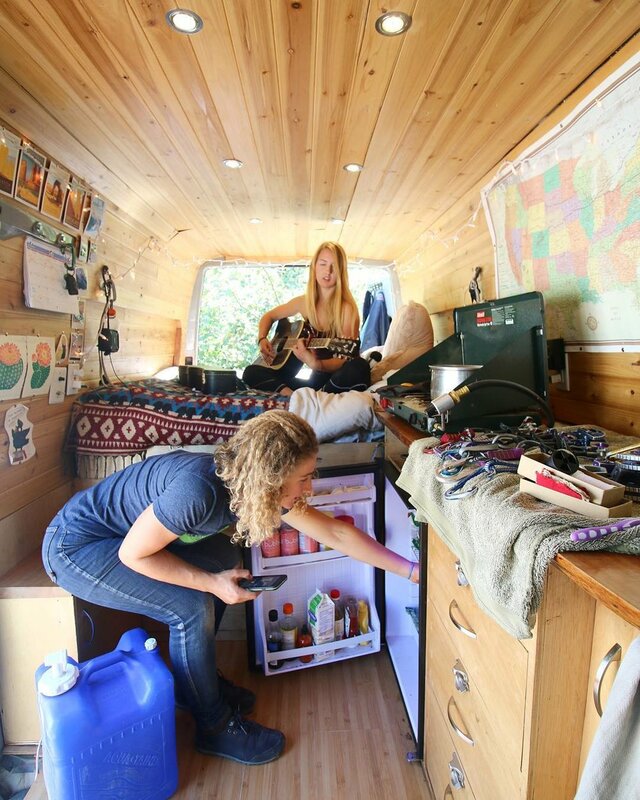 While being on the rock is always a preference for her, Kaya spends her off days with fellow climbers playing ukulele, practicing yoga or enjyoing the views around her from the top of her van. 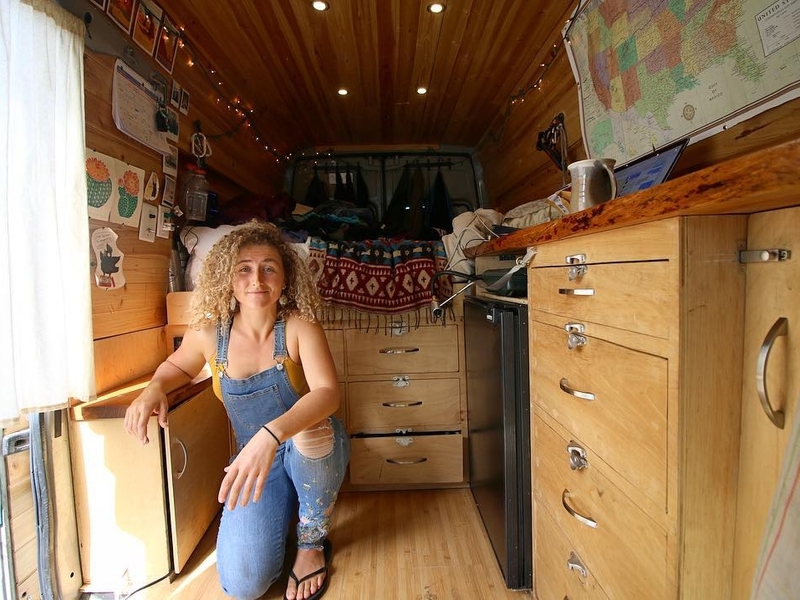 Kaya has equiped her van with a 290 watt solar panel to provide a sufficient power source for her 240 amp hour battery bank. Kaya built her electrical system to ensure it could power her fridge, extractor fan and have plenty left over for charging her laptop and using the lights. When cold, Kaya plugs in an electric blanket to her 600 watt inverter to stay warm. Kaya invested in a battery meter as well to closely monitor the amount of power she has remaining in her battery bank. When sun is limited Kaya uses shore power to plug into an electric outlet and charge her batteries in the matter of a few hours. This can come in handy especially when urban camping in cities or traveling in the winter months when sun is limited.